Instead of walking down the aisle, this bride and groom chose to wade through the water. "Fishing is our life and our livelihood. It didn't make any sense to do it any other way," Kadie Walsh, 30, of Kodiak Island, Alaska, told GoodMorningAmerica.com. 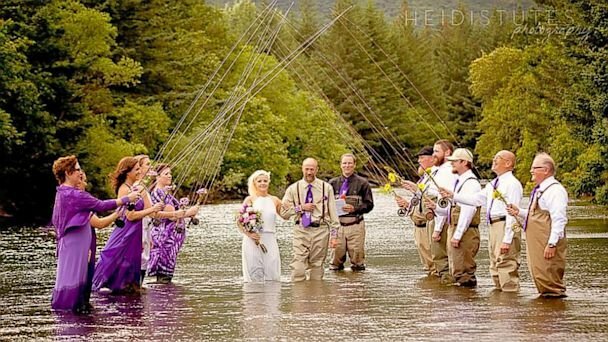 Walsh and her husband, Dake Schmidt, 43, tied the knot Saturday while knee-deep in the middle of Alaska's Buskin River, with water temperatures only reaching about 40 degrees. In order to brace themselves for the frigid water temperatures, the bridesmaids wore socks and leggings under their hip waders, which were conveniently hidden underneath the purple gowns of their choosing. "Men look better in chest waders and women look sexier in hip waders," Walsh explained. "A lot of my friends came in from out of state and aren't used to fishing as much as I am and wading in rivers, so I let them choose their own dresses." The bridesmaids and groomsmen even carried fishing poles to create an archway for the couple as they said their "I Do's," creating a picture-perfect outdoor ceremony just before a storm rolled through. "We were in the water for about 10 to 15 minutes," Walsh said. "For two or three days prior to the wedding it was absolutely horrible weather. We were just hoping, and I just trusted on this faith it was going to clear. And it did. It cleared for exactly the time we needed, and then got crappy again." They even got wildlife involved in the nature-filled nuptials, using freshly-caught king salmon as the ring bearers. "Our rings were carried in the mouths of two king salmon," Walsh said. "We had the rings in a Ziploc bag and the bag was wired into the fish's mouth. It was kind of a leap of faith hoping they didn't drop into the river." Fortunately, the rings made it safely onto the bride and groom's fingers before they exited the river to a much warmer, indoor reception. "It worked out perfectly," she said. The happy couple, who own MemoryMakers Tour and Guide Service, aren't planning on taking their honeymoon until next year, after the high season for their fishing, photography and sightseeing tours is over. "Our business is in full swing so we don't have the opportunity to get away right now," Walsh said. "But we do plan getting off the island in January or February when it's really cool here, and going somewhere tropical with excellent fishing, of course."